Making art is all about solving problems. How can I form this shape? Which two colors will look best here? What material should I use to make this part sturdy? If you think about it, you are facing and solving hundreds of tiny problems throughout the process of making something. Every one of us develops unique ways to approach and solve all of these tiny problems as we work. I want to learn all of the solutions. The best way to do this is to sew other people's patterns. In doing so I get to experience their problem solving. I'm allowed to see inside their process. I create something as they would create it. I find this totally fascinating. This is how we learn. 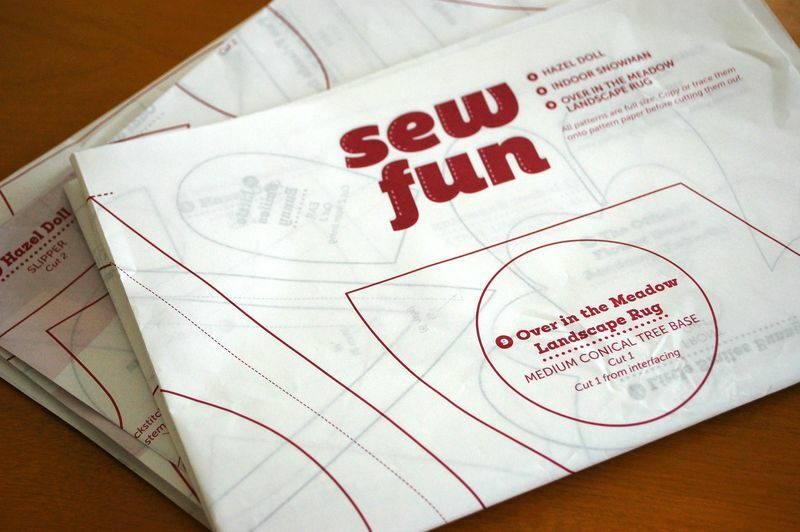 Last week I got a copy of Sew Fun, a new book by artist Deborah Fisher. When I opened the book I was drawn in by a particular project where I could see that Deborah had solved a problem in a way that was totally mysterious to me. I wanted to sew it to experience her thinking. The project is the Hazel Doll. Look at the nose. That nose! It looked needle sculpted, but not quite. How did she do it? In the description of this project Deborah says she adapted the nose from a technique she learned from a doll maker named Dorothy Lazara. So I Googled Dorothy Lazara, but I couldn't find anything about her. I asked Deborah to tell me more. "I am also not finding any of Dorothy's work online. She died about 4 years ago so I suppose it just might not be there any more. I have a small doll she made but it does not have that particular nose." "For the summer, when I was 15, I would take the train for about 30 minutes to the station near her and then walk to her house. My mother taught me to sew, but Dorothy taught me how to sew whimsy. She had a very proper kind of appearance but all of her humor came out in her work. 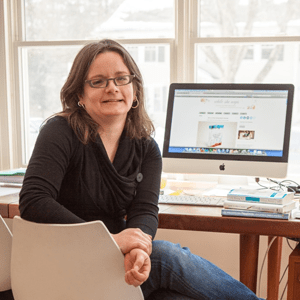 I lost touch with her after a while (she had moved from Long Island to Paducah, Kentucky), but when I heard she was ill I contacted her and her daughter to let them know what an impact she had had on my work." I love the thought that by making the Hazel Doll I would be learning Dorothy's technique, via Deborah. Doll makers connecting over generations. I made her from wool. 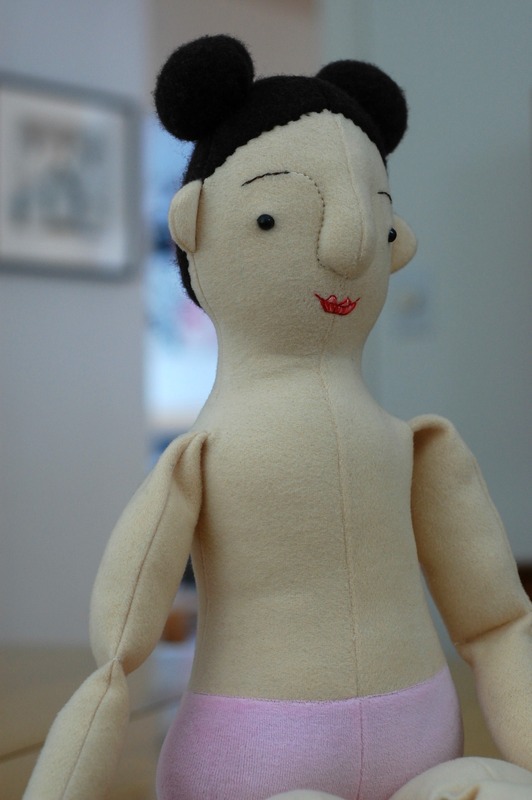 I know wool is an unconventional choice (the pattern calls for cotton or linen), but then I figured if Mimi Kirchner can make gorgeous wool dolls than wool would be okay. Plus I love fabrics that are soft and stretchy. So her body is wool blanketing, her underpants are velour, and her hair is made from a felted wool sweater. I added the hair buns. Isn't she womanly! She's wonderfully pear-shaped. The construction of the nose is indeed very, very cool. I think I could adapt the nose technique to make breasts, too, and then she could have a bra. 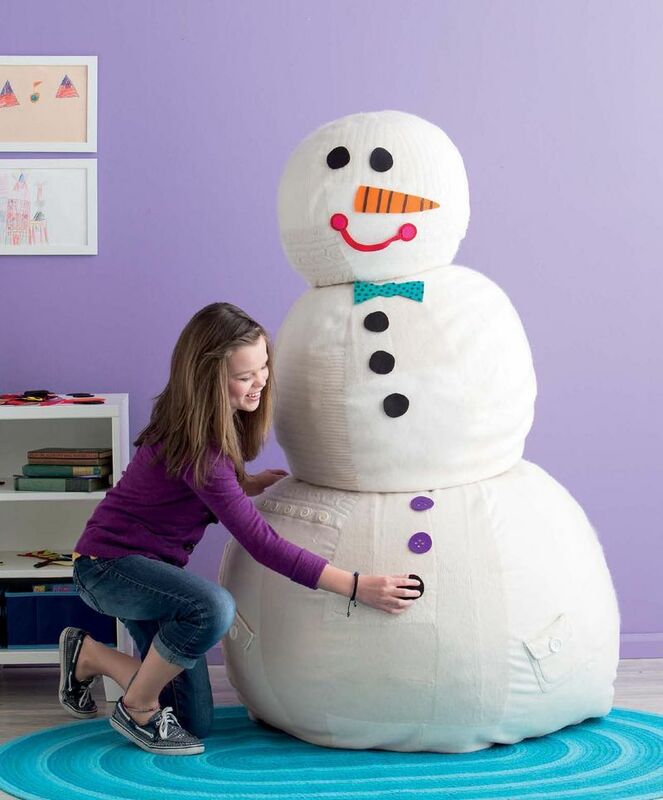 You can take it apart and use each section as a bean bag chair. Other projects include a landscape rug with movable elements like hills and gardens, a two-sided storytime quilt with applique designs based on children's drawings, and an umbrella. When you make ambitious projects you learn new things. You stretch. 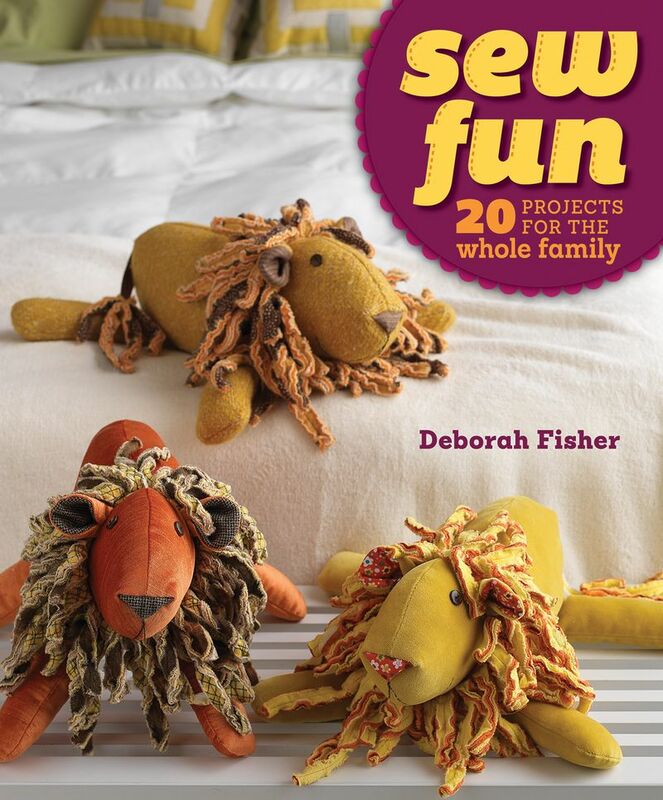 To make the lion on the book's cover, for example, you'll make your own chenille from strips of flannel cut on the bias. Each of these techniques opens creative doors. What else could you do with handmade chenille? 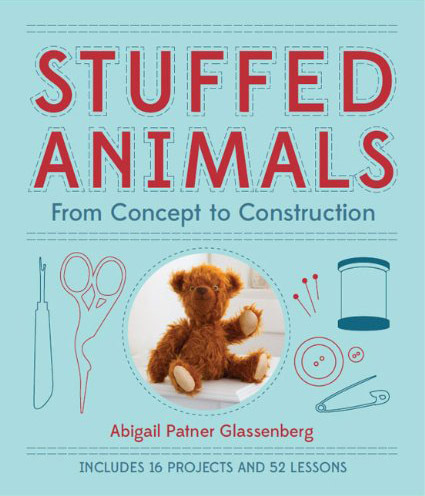 Interweave put some money behind this book, which I love to see, especially for a book with a stuffed animal on the cover. There's a clear envelope glued inside the back cover with two large sheets of full-sized pattern pieces tucked inside (they're on real paper, too, not tissue). All of the toys are professionally photographed in a bright, pretty house-like setting. They hired two lovely models, a woman and a girl, to show off the projects. The page layout is pretty and clean, with a color pallette that brings out Deborah's work beautifully. The whole thing is a great package. The instructions could benefit from a few more diagrams, and a few more inset photos of the projects from different angles. There isn't a picture of Hazel in her underwear, for example, which makes it tricky to know if you're constructing her just right. We're spoiled now by digital patterns where there's no limit to the number of photos that can be shown. This book is ambitious in one more way, too. Deborah shows several samples for many of the projects. The three lions on the cover are a great example. There's an easy pattern for a bunny softie and the beauty shot shows us six bunnies sewn in stripes, houndstooth, and solid wool fabrics. It takes hours and hours to make so many samples, especially on a tight book deadline, but it really pays off when readers get to see different color combinations and embelishment options. 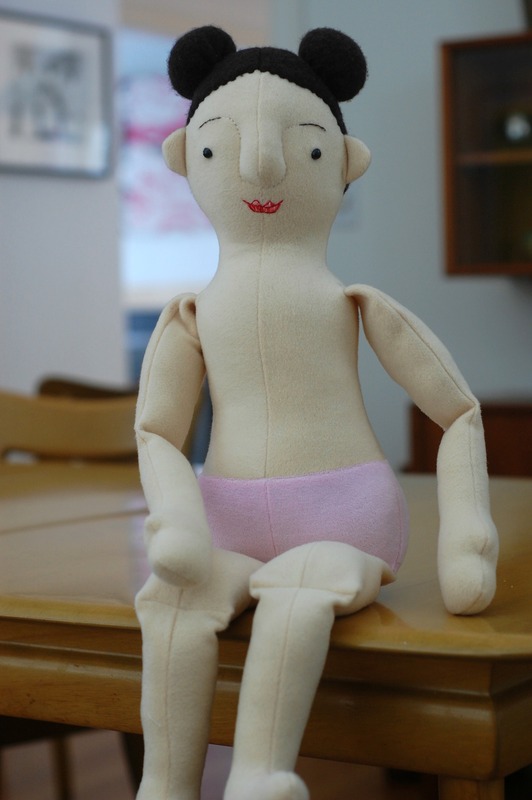 About the Hazel Doll, Deborah told me, "I was planning to make several more versions of her for the book but I had to stop myself at two because of all the other projects that had to be made. I would love to do a whole book of dolls one day!" 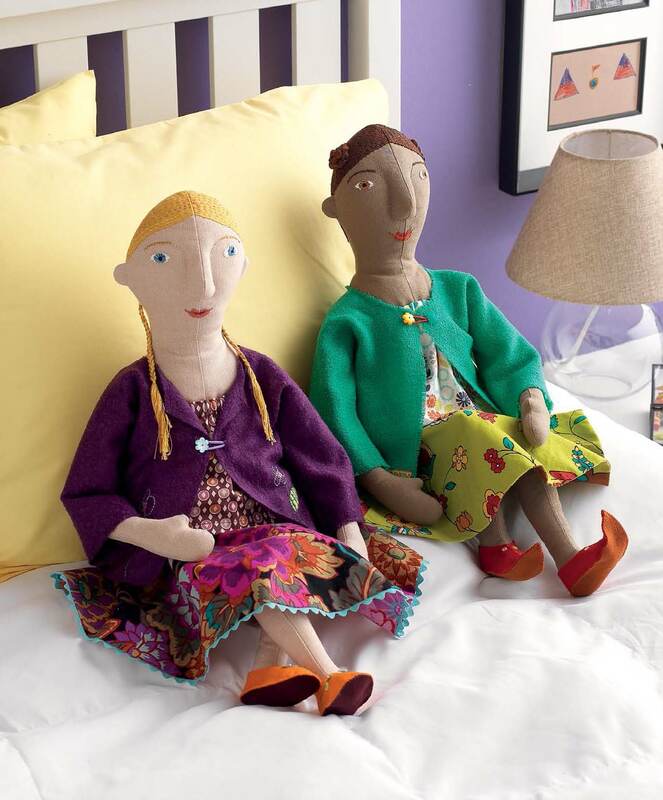 I loved this project and would be happy to see more doll patterns from Deborah. I literally had to tear myself away from the studio yesterday after working on this nearly the whole day. now in the Inteweave store for $26.99 or as an ebook for $19.95. Disclaimer: I recieved a free copy of this book for review. 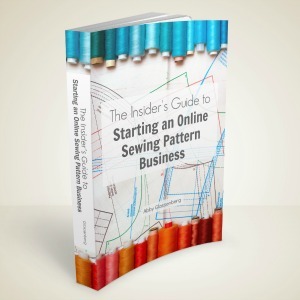 The Interweave Store link is an affiliate link. While the style of the doll itself isn’t to my tastes (I just personally prefer baby type dolls) I have to say that I love your choice of fabric. The wool worked out beautifully, which is good to know. Much more soft and inviting. This book looks like a lot of fun. Thanks for the great review! looks like the books has lots of diferent projects, very interesting, the construction of the face looks very interesting too, you did a great job! You are so inspiring in your desire to learn new things, Abby! I love how you showcase other people who are creating in the same genre as your own work–so generous to them and to us. 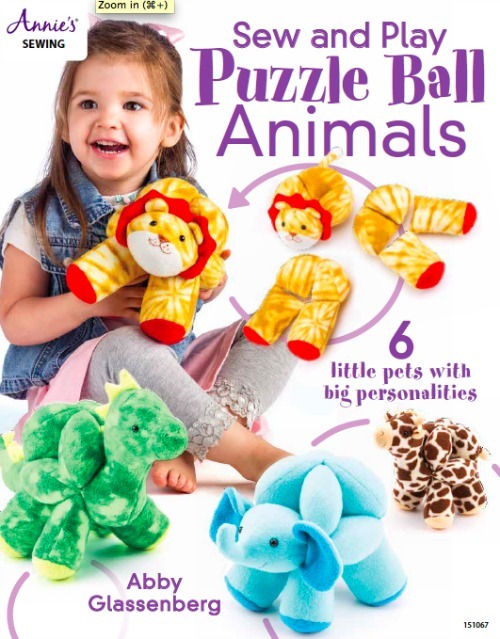 I really like the soft look of your Hazel doll–I know that putting that puzzle together must have been so much fun. 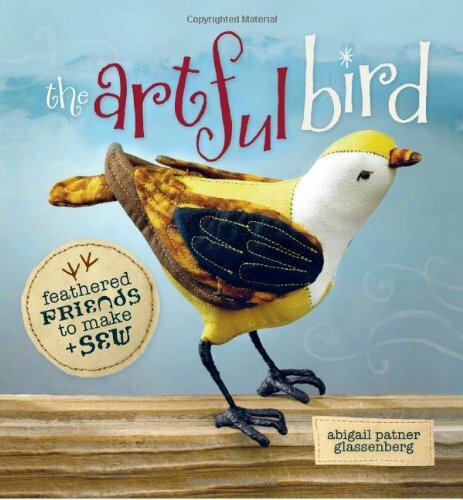 This book looks fantastic–going right on my “must-have” list. Thanks so much for your thoughtful review. That does look like a great book! I LOVE the nose too, noses are hard to get right on dolls/soft toys, so that’s a great solution. And to go further and make breasts/a bra….Perfect! Those dolls are fantastic! Definitely adding to my book wishlist. Too funny….I bought the book this week because of the Hazel doll….and what did I do? The same as you, went and googled Dorothy Lazara oddly enough with almost the same answers as you, but I didn’t find nothing, I found your book review! Thank you, I loved reading more of what was said about her, and the author. I would be tickled pink if she did a doll book. Dolls are my thing, so the only chapter I cared about was the chapter 4 LOVE Thank you for your time to make my search come up with something useful! Janice p.s. your doll is super cute! Wool sounds heavenly. That’s so great, Janice! I’m glad we’ve found each other through Deborah’s book. I’m Dorothy Lazara’s daughter, and came upon this article upon googling my mom on Mother’s Day. Belated thanks for your kindness! I have much of my mom’s work in my possession, which really should be documented more thoroughly. ❤️Please feel free to reach out to me. So nice to hear from you! I hope you are well. Please feel free to email me debadoo2@earthlink.net.